I Am with you always, says the Lord. There is never a time when you are alone. 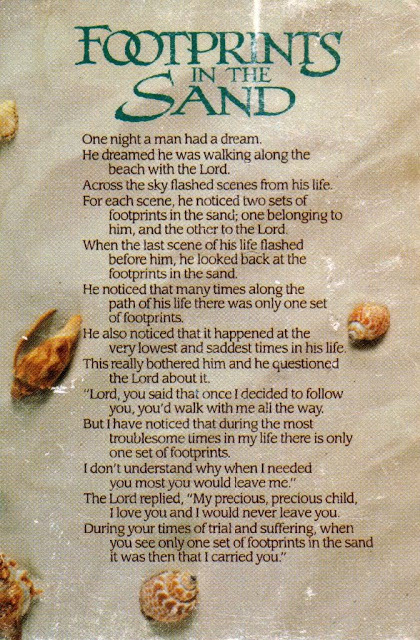 I will never leave you nor forsake you. There are times when you have felt all alone, but you were not. I Am not a silent observer, but active always in your life. I Am with you wherever you go and wherever you are, says the Lord. I Am with you in the very difficulties that you are going through. You are not going through them without Me. I will see you through and insure that you arrive safely on the other side. I Am with you in all of your uncertainties. You may not understand or have a clue, but I do. I have led you all the way to where you are today, and I will lead you continually. I know the way through the wilderness of your life and I will guide you continually, one step at a time. Yes, I will lead you out and keep you safe through the long, uncertain journey that you are taking. I know that you have not been this way before. That is why I Am preparing the way ahead of you, removing the stumbling blocks, lighting the path and leading you softly on. Trust in Me at all times, for you will have everything that you need in Me to secure and provision you. I Am equipping you and helping you all the way, says the Lord. You have many questions and many things that you want to know, but do not fret about the things that you don’t understand. Give them to Me. I will give you the wisdom and knowledge and understanding that you need for every decision that you have to make that is too hard for you. It is not too hard for Me. I Am the all-wise, ever-present, all-knowing, almighty God, and I will supply your need. I will give you the answers that you have need of, says the Lord. Rely on Me and trust in Me. I will not fail you, and as you follow My lead, you will not fail, either. My voice is the still, small voice on the inside of you. You will feel that nudge and prompting within and that is MY Spirit, leading and guiding you subtly along. Be still and listen, for I have never failed to speak to you and direct your path. I will not abandon you in the difficult times. As you move ahead and follow My lead, you will be able to look back at the things that you are going through now and see that it was My hand and My voice that helped you through and got you safely to the other side. TRUST IN ME at all times, and do not depend upon a LOUD voice. Trust in My still small voice on the inside of you. I have always been with you, and you have seen the difficulties that I have helped you to overcome. You are overcoming now, says the Lord. Just keep going and keep believing and keep trusting and keep relying on Me, and soon you will be out of the darkness and see the dawning of a new and brighter day, says the Lord.